Approved for use in ANSI (United States) and CSA (Canada) markets, the new Genie Lift Tools Material Carrier attachment offers Genie GS-2669, GS-3369 and GS-4069 DC and RT rough terrain scissor lift operators a solution to efficiently carry materials to jobsites. Designed to accommodate a wide range of materials and higher load capacities than a standard pipe cradle attachment, this new Genie accessory is ideal for use in applications that require lifting materials to height, such as tilt-up construction, post-frame building construction, fire suppression installation, HVAC installation, rooftop contracting and facility maintenance. 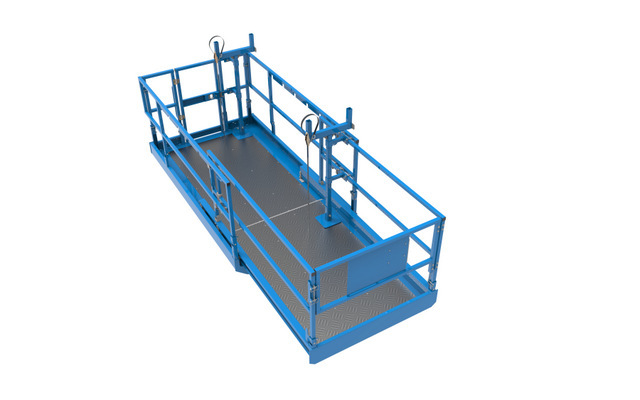 Other benefits of the Genie Lift Tools Material Carrier attachment are that it can accommodate more than one pipe, can be positioned on the scissor lift’s main platform or extension deck, can still be used with the extension deck retracted and can be installed laterally or longitudinally. Available in North America, the Genie Lift Tools Material Carrier attachment is a factory-approved option and is available as an aftermarket part, kit #1288239GT. It can be installed, or removed, in less than 20 minutes. This accessory may be evaluated for use in select areas of Europe, the Middle East, Africa and Russia (EMEAR) in the future, pending CE certification and country-specific regulations approval. For more information about Genie, click this link. Hard!